The online apologetics and discernment work Apprising Ministries has been among those who’ve been reporting on an ill-advised decision by Dr. John Piper to bring Purpose Driven Pope Rick Warren into the Desiring God Conference 2010 as the keynote speaker. You only thought junior high was over. 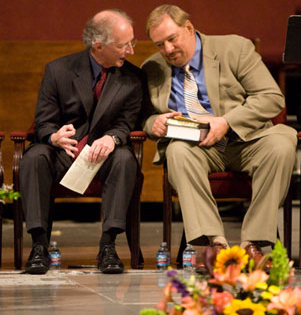 But lately the evangelical blog world has been abuzz because John Piper invited Rick Warren to speak for his Desiring God National Conference, October 1–3, 2010. You see, a lot of folks who like John don’t like Rick. So now some of John’s friends aren’t sure they want to hang out with him anymore. They may not come to his party in Minneapolis. And they aren’t sure that you should either. Let me help Hansen out a bit here with what appears as grandstanding rhetoric ala Emerging Church icon Rob Bell: In a world desperately in need of the gospel, we spend much of our time and energy debating who’s in and who’s out, who’s up and who’s down. What gospel we are to be bringing into the world is precisely the point, which Hansen does appear to understand. The Reformed ranks have swelled with the refugees of pragmatic evangelicalism. Piper threatened this united front by inviting Warren. But Piper, as the movement’s central figure, has always offered more than just critique. He put forward a compelling vision of Christian Hedonism. “God is most glorified when we are most satisfied in him,” he writes in his seminal book, Desiring God. You can read the rest of Collin Hansen’s CT article right here.